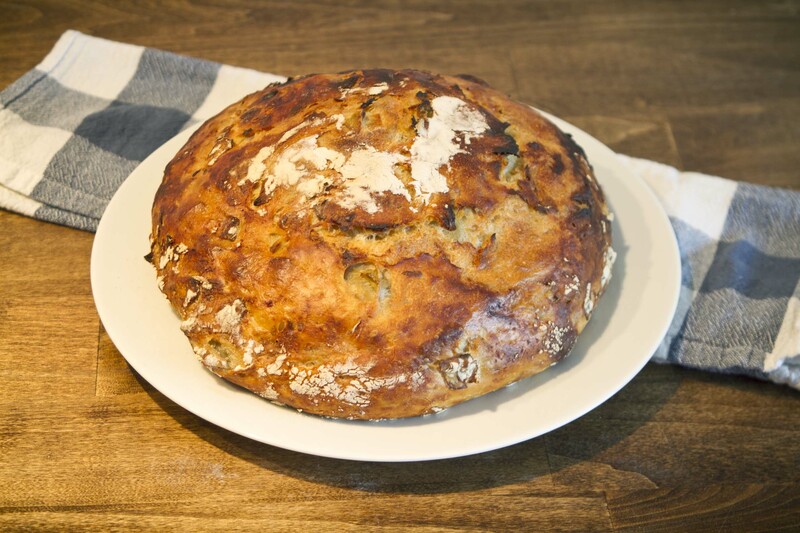 Welcome to the Virtual Vegan Potluck – Artichoke and Roasted Garlic Bread! Welcome to the Virtual Vegan Potluck! I’m so excited to be participating again and bringing you a yummy new bread recipe! If you just happened upon my blog and don’t know what the Virtual Vegan Potluck is, check it out! You can start at the beginning of the potluck at Vegan Bloggers Unite! To see the blog before mine in the potluck go back to Spontaneous Tomato. To see the blog after mine in the potluck go forward to Bite Me, I’m Vegan. Thanks to Annie from An Unrefined Vegan for all her hard work organizing the potluck! Now, on to the recipe! 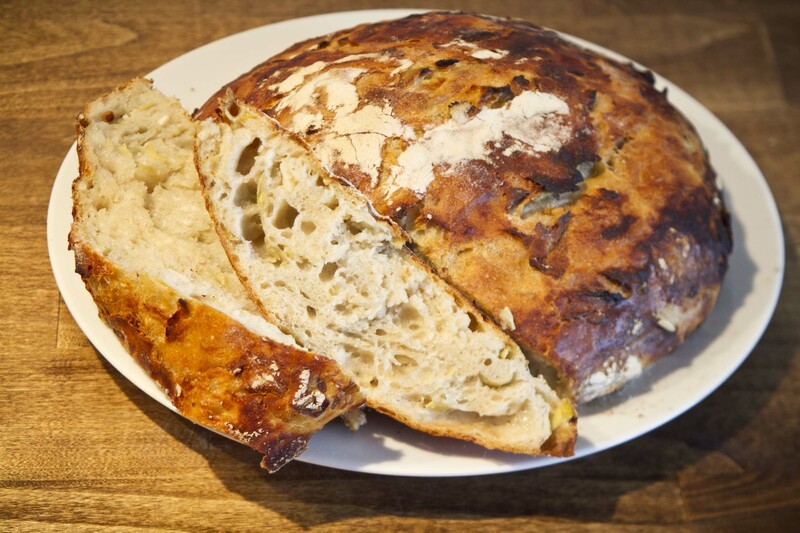 I decided to share my recipe for no-knead artichoke and roasted garlic bread! This is a perfect bread to eat on it’s own, with a little vegan butter, as a sandwich, or even with some vegan artichoke or spinach dip! It has a subtle, but present artichoke and roasted garlic flavor. You could also throw in some chopped olives if you want a stronger, punchier flavor. This is a really simple no-knead recipe, that doesn’t take much time to prepare. It does take two days to actually make the bread, but most of that time is spent waiting for the bread to rise. There is little actual work involved. Here are a few tips before we get started. 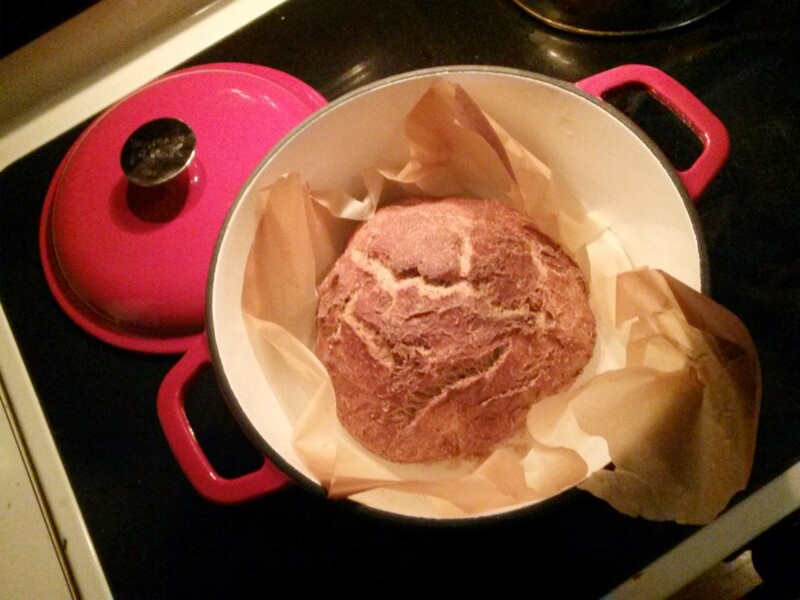 Ideally you want to bake the bread in a pot meant for bread baking, such as a dutch oven. If you don’t have a dutch oven, you can use a regular pot with a lid, as long as it is safe in the oven at high temperatures. Take a look at this article for more info. My pots unfortunately have handles that aren’t metal so I didn’t want to risk them melting in the oven. I used a pizza pan and tin foil instead, which isn’t ideal, but it worked out pretty well. The crust still got nice and crispy. A dutch oven is on my wish list! Baking bread with steam helps the bread form a nice crust. Placing a pan in the oven to preheat, and then adding water will create steam. For more info on how steam helps during bread baking, read this. You only need to leave the steaming water in the oven for the first 10 minutes of baking. The bread rises for 16-20 hours, so plan out when you want to bake the bread and prep the dough accordingly. I made my dough at 11am so my bread baking window was 3am to 7am. I ended up having to wake up early to bake the bread, which wasn’t a big deal, but it’s good to do some quick math and think out your timing first! Prep your roasted garlic ahead of time. I made mine the day before so it was cool enough to touch when I was making the dough. Preheat the oven to 400°. Cut the top off of a whole head of garlic. Place the garlic on a piece of tin foil and drizzle a little olive oil on top. Wrap the tinfoil around it and place it in the oven for 35 to 45 minutes. The garlic will look a little browned when it’s finished. Once they’re done and cooled, you can store the garlic in the fridge until you’re ready to add it to the dough. In a small bowl, combine the yeast and sugar. Add 1/2 cup of warm, but not too hot, water. Let this sit for about 5-10 minutes to allow the yeast to proof. While you’re waiting, drain the artichoke hearts very well and chop them into small pieces. Squeeze the roasted garlic cloves out of the head of garlic. They should pop out pretty easily. Mash up the garlic cloves. In a large bowl, combine the flour, salt, proofed yeast mixture, and the remaining water (which should be lukewarm). Stir the mixture until it just starts to pull together, then add in the chopped artichokes and roasted garlic. Stir until well combined. This is a no-knead dough, so it’s okay that the dough is stickier and wetter than a kneaded dough would be. Cover the dough with a clean dishtowel and allow it to rise for 16-20 hours. When it’s close to done rising, preheat your oven to 475°. Place an empty metal pan on the bottom shelf of the oven to preheat. Once the oven is hot, you will place water into the pan to create steam, so make sure it’s deep enough to hold water. Roll your dough out onto a generously floured surface. Fold it over a couple times to form a loaf. Sprinkle flour on top of the loaf and slice a vent into the loaf. Place the loaf in a dutch oven, an oven-safe pot with a lid, or on a pan covered with tin foil (see note above). Carefully pour some water into the pan on the bottom shelf, and place your bread on the top shelf (see note above). After 10 minutes of baking, carefully remove the pan of water. Allow the bread to keep baking covered for another 20 minutes, then remove the foil or lid and bake for 20 more minutes (50 minutes total baking time). Remove the bread from the oven and allow it to cool. Enjoy! I hope you enjoyed the recipe and that you’ll stop by The Vegan Kat again sometime! To continue on in the Virtual Vegan Potluck click the links below! I was inspired to try making my own vegan naan after seeing this recipe posted on the blog Bacon is Not an Herb a while back. She originally found the naan recipe on PETA’s website. I didn’t change anything (besides adding a little salt and garlic powder during cooking) because it’s a simple recipe and it came out well. I’m just sharing in hopes that you’ll feel inspired to make some too! A lot of times naan that you find in restaurants or stores isn’t vegan, so it was really nice to make my own. I was really missing it from my pre-vegan days! Thanks to Terri from Bacon is Not an Herb for posting this recipe! •In a large bowl, dissolve the yeast in warm water. Let stand about 10 minutes, until frothy. •Stir in the sugar, soy milk, salt, and enough flour to make a soft dough, between 1 3/4 to 2 cups. •Knead for 6 to 8 minutes on a lightly floured surface or until smooth. Place in a well-oiled bowl, cover with a damp cloth, and set aside to rise. Let it rise 1 hour, until the dough has doubled in volume. •Punch down the dough then roll into golf ball-size pieces and place on a baking sheet. Cover with a towel and allow to rise until doubled in size, about 30 minutes. •Preheat a pan to high heat and lightly oil. Roll each ball of dough into a thin circle then add to pan one at a time. Cook for 2 to 3 minutes, or until bubbles begin to brown and brush the top side with additional oil. Flip the bread and cook for 2 to 3 minutes on the other side. I tried sprinkling a little garlic powder and salt on top before flipping and it turned out really well. Continue until all the bread is cooked.